This .40 S&W ammunition from Winchester is a great choice for the range, or for cost-effective self defense. 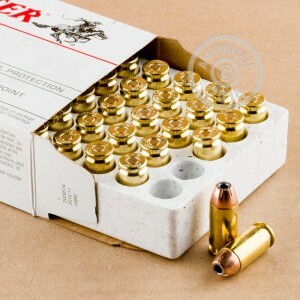 Each cartridge in this box of 50 fires a 180 grain jacketed hollow point bullet at a muzzle velocity of 1,010 feet per second. 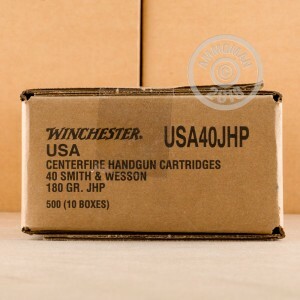 Winchester ammo is loaded in the USA and uses non-corrosive Boxer primers and brass cases. 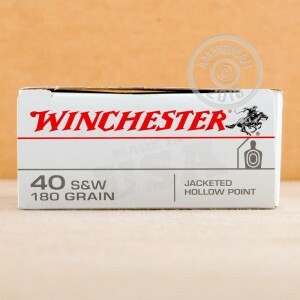 Their "white box" ammo is known for its cost-effectiveness and comes in FMJ and JHP varieties.